Mini decided that she wanted a sling for her baby doll like I had for her brother and her, so I hit the trusty ol' 'Net. 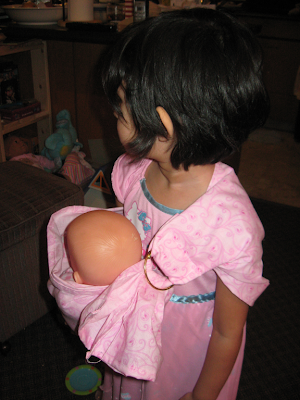 I found a really easy (and free) pattern by Jan Andrea, who makes great baby slings for non-doll babies too. "Easy" is key, because I'm a spaz on the sewing machine. The last time I made anything more complex than sewing closed a hole in Roomie's parka pocket was when I made a green gingham apron in Mrs. Cordner's Home-Ec class in Grade 7. Anyway, the sling turned out really cute! And Mini loves it. She proudly carries her baby around the house, and she's looking forward to taking her baby on strolls down Corydon this summer. So, now I'm making a bigger one for her slightly bigger baby doll and another for my friend Harmzie's girl G.
It was really a beautiful sling. I liked it. It looks awesome. I showed G the picture & she loves it! Also, so did the boy. And said he wants one too... I just tell you that because it's funny. Don't worry, they'll share! Really?!!! That's so cool!!! I'm so glad she loves it.